Sweet Mountain Farm, LLC is selling hybrid Russian nucleus colonies split from our certified and overwintered colonies. Order Russian nucleus colonies today! NORTHERN bred stock will be available for pick up on June 23, 2018. Before purchasing a Russian nucleus colony, please visit the Sweet Mountain Farm website to read about the significant differences of this honeybee species. Russians require a more attentive management style, so please, do your research before you make a purchase! The nucleus is a complete colony with drawn comb and bees in all stages of development. Nucleus colonies are split in the spring about mid-May from an established colony. Queens start laying about mid-June but delivery is always contingent upon the weather. Pick up times can change. Colonies are raised on Washington Island. This means that the colony you are purchasing is roughly two months behind southern bred bees. Extracting honey is rarely expected the first year. In some cases colonies installed in late June will produce enough honey for extraction but this should not be expected. Colonies that do not store at least 12 medium frames of honey should be fed the first winter. Each nucleus consists of five medium frames. One frame is usually empty or slightly drawn and is used for expansion and transport. We do not deal the frames to you like a deck of cards so that each buyer receives an equal number of eggs, larva, capped brood, honey, and pollen. Each split colony has 40 days to strike its own balance as an individual living organism. You are buying a family. 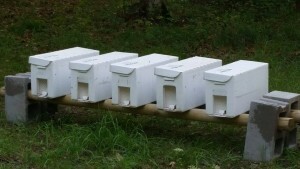 Sweet Mountain Farm’s Russian honeybees live in a chemical free hive and build up very quickly. Be prepared to super! The colony is packaged in a portable and re-usable Correx transport box that you may keep. Ventilation holes are located on every side. One piece construction eliminates lost covers. Sister Bay, June 23, 2018 – 8:00 a.m – 8:30 a.m.
Sturgeon Bay, June 23, 2018 – 9:00 a.m. – 10:00 a.m.
Green Bay, June 23, 2018 – 11:00 a.m. – 1:00 p.m.
Washington Island, 10:00 a.m. – 3:00 p.m.
Also, don’t forget that we sell an upscale northern white cedar beehive that is amazing. The craftsmanship is remarkable and the hive is specifically designed by me for my Russian honeybees. Check out the link for details. ATTENTION! SHOPPING CART DELIVERY TIMES WILL NOT APPLY TO YOUR ORDER WHEN ORDERING NUCLEUS COLONIES OR BEEHIVES ONLINE! Order your colonies today, or send me an email with your name, address, pick up location and number of colonies forwarding your payment to the address below.